Ceiling Fan Light Bulb Pull #3DThursday #3DPrinting « Adafruit Industries – Makers, hackers, artists, designers and engineers! 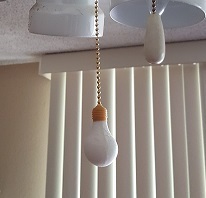 My wife was always complaining about how she could never remember which chain to pull to turn the light on with the ceiling fan, so I decided to make something to help her remember. I found several chain pulls but liked the one ggangemi had. I just wanted to make it in more than one color. Splitting it would make it easier to print and allow each part to be printed in a different color.